Presbyterian minister, Revolutionary soldier and chaplain, educator, pioneer missionary in the Natchez country. Grave is 50 yards north. James Hall, Presbyterian minister and missionary, was born in Carlisle, Pennsylvania to James and Prudence Hall, Scots-Irish immigrants in 1744. In 1751, the Halls migrated down the Great Wagon Road to North Carolina, settling near Fourth Creek in present-day Iredell County. The family joined the congregation of Centre Church. As a young man, Hall entered the College of New Jersey at Princeton, where he studied theology under John Witherspoon and graduated in 1774. He vowed to join the ministry, and turned down the offer of a mathematics professorship at the school. 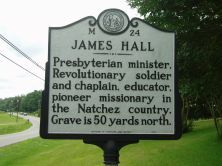 Returning to North Carolina, Hall gained a license to preach from the Orange Presbytery in late 1775. Shortly after his licensing, the Revolutionary War came to Fourth Creek as most of the local militia organized to take part in Griffith Rutherford’s punitive expedition against the Cherokee. Hall served on the campaign as a chaplain with one of the militia regiments. In the winter of 1776, Hall returned to itinerant preaching in his community before being ordained as pastor of Fourth Creek, Bethany, and Concord congregations in April 1778. His parish covered roughly six hundred square miles. Tradition states that James Hall raised a company of militia dragoons when British forces under Cornwallis moved into southern North Carolina in 1780-1781. He apparently turned down command of the unit, mostly men from his own congregation, although they refused to march unless he took command. One observer, writing nearly fifty years after the war’s conclusion, claimed that he saw Hall “with his three-cornered hat” leading his militia company through Charlotte. Hall’s company apparently served with the forces under William Lee Davidson until Davidson’s death at Cowan’s Ford. Some accounts suggest that Hall was actually offered command of the North Carolina militia of the southwestern counties after Davidson’s demise; however, there is no evidence to support these claims. After Davidson’s death, command passed to Francis Locke. But, General Andrew Pickens soon took command of all militia forces in the southwestern half of the state. Hall returned to preaching at the close of his militia unit’s term of service and continued to do so through the remaining two years of the Revolution. After the war he held several revivals in the region, gaining as many as 140 new converts. In 1786, he voyaged to New York to attend a meeting of the New York-Philadelphia Synod, and helped organize the General Assembly of the Presbytery Church. Two years later he organized the Synod of the Carolinas and served as an assembly member until it was superseded by the Synod of North Carolina in 1813. In 1790, Hall left his pastorates and began missionary work, eventually traveling to the lower Mississippi Valley. He later published an account of his 1800 journey to Natchez, Mississippi, in A History of the Mississippi Territory, followed a year later by A Narrative of a Most Extraordinary Work of Religion in North Carolina. Upon his return to North Carolina, Hall became one of the leading camp revival preachers in the western half of the state. 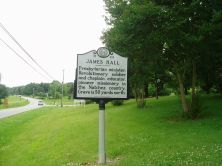 Hall was the principal founder of Clio’s Nursery in 1778, a school which provided a Presbyterian education for western North Carolinians. The University of North Carolina conferred upon Hall an honorary doctorate of divinity on the same day as David Caldwell. Hall donated 250 acres in Tennessee to the College of New Jersey, and sixty volumes from his personal library to the University of North Carolina. In his final years, Hall became increasingly despondent and withdrawn. Contemporaries noted that his depression took over his life, and that he refused to preach for nearly a year and a half. A neighbor finally “exercised a deaf-and-dumb demon” from him, after which Hall reportedly regained some of his former livelihood. Hall died on July 25, 1826, and was buried in the Bethany Church cemetery. Devoted entirely to his religious faith, Hall had never been married.